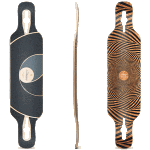 This section has a selection of the best longboard decks on the market, for those who are looking to built a custom make complete longboard for every style of longboarding from cruising, dancing/cross-stepping, to sliding and freeriding as well as downhill and racing. If your goal is to set-up the best board any style of longboarding that requires specific Trucks, Wheels, Bearings and/or Hardware... this section will guide you to it. You will find here a massive range longboard decks with different shapes, sizes, constructions, flex from the best brands in the market. 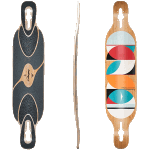 Basement Skate gives you 10% off the longboard components when you select any of these Decks. What are the main styles of longboard skateboarding? Knowing the Longboard Skateboarding has many different styles here is a guide of the most popular styles and what to look for when your selecting a longboard or a longboard setup. • Commuting & Long Distance Traveling: This is the most popular use for longboards. Pretty much any longboard setup is built to transport you wherever you wish to go. In this case, most of all Complete Longboards are perfect for it. We do recommend Drop-Through Longboards for beginners or long distance riders, since they sit lower the ground with a lower Centre of gravity to give more stability and control for first time riders and not to high up to give you ease while pushing and breaking. • Carving & Cruising: Is like surfing on your board and making the best when riding on flatland or any path. Pumping your board can increase the acceleration of your ride on the flat land and carving can or decrease speed when dropping down a hill. For these styles get yourself a deck with some flex to be able to pump have fun carving. You could choose Top Mount Setup for carving or a Drop-Through for cruiser for riders who are just learning to make you feel lower to the ground. • Dancing & Cross Stepping: If you like to dance and cross step while riding down a nice path, select a longer deck 40”- 48” get a bit of flex and at least back kick if not double kicks for those shuvets. You could find a few setup complete pre-made and a big variety of decks from the best brands worldwide. • Sliding & Freeriding: If you don’t know what this is, imagine Snowboarders getting down the slopes and getting sideways on their board to slow down, stop or just for the pure fun of doing it. Well with the proper set of Slide Wheels you can do it in your board too, just look for a deck with some concave, either W or 3D concave, the advantages of riding on a board with concave is that your feet can easily grab hold of your board while you’re are trying to throw it sideways. • Downhill & Speed Skateboarding: For all the speed lovers, we have a big selection of Downhill boards ready to set them up with some techy made Longboard Trucks. Arbor - The guys from Arbor Skateboards make premium environmentally conscious boards using exotic woods like Hawaiian koa, walnut and bamboo. 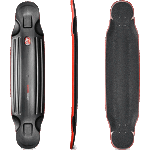 Not only they make great Complete Cruisers but they also have a selected range of Downhill & Freeriding decks. Bustin - Directly from Brooklyn New York with a collection of boards made for cruising, carving, dancing or cross-stepping, freeriding or some well designed Downhill decks. Comet is a brand from the U.S... very famous for their downhill/urban free-ride double kicktails. Most of their boards come with an original graphic screen printed by hand and are press individually to give the best quality. Fang Fang comes from Western Australia, these guys have researched and developed a selection of well shaped decks for Downhill, Sliding and Cruising with a great entry level price. Earthwing Earthwing is a long time skateboard and longboard brand from the US. These guys press boards for all urban style freeriding, inspired in their own popsicle skateboard shapes but built in longboard sizes with great concave designs. Landyachtz - From Vancouver - Canada, the crew from Landy have been making great quality boards from a long time ago. Their big reputation comes from their experience in the longboard scene as well as their orientation in making boards they like to ride. From Riders to Riders, they have a big range of shapes and styles. Loaded Boards are from California. The guys from Loaded have the best reputation for making top quality and super light cruising boards and freeride boards. They have great knowledge and experience at doing it which is why they are super famous around the globe and the longboard industry. Carving, cruising, dancing, pumping, sliding and now downhill is the Loaded world. Omen Longboards from Seatle, USA. Innovative constructions and designs. Excellent quality boards. Powell Peralta Who doesn't know Powell Peralta? Well if you don't, you should. Powell Peralta is one of the biggest skateboard companies from all times. Founded in 1978 and based in California, USA by Old School pro riders George Powell and Stacy Peralta. These guys know how to make great boards and make them to last decades. Expect nothing but quality and amazing designs. Currently focusing in Downhill and Freeride longboards made in Cali and designed by 2 times World Champion Kevin Reimer. Prism - Prism is the product of 2 really well known and incredible riders: Liam Morgan and James Kelly from North California. Making Freeriding and Downhill decks applying their own design and knowledge in their designs to give the best for riders around the world. Rayne Rayne Longboards are synonym of top quality, super light and amazing designed longboards. These guys are based in North Vancouver, Canada and all Rayne boards are made by them in Canada, known for their their top secret technology that creates the toughest and lightest premium bamboo longboards in the market. Sector 9 - This company is well know for longboarding but they also have a top Downhill team in charged of the design of the Downhill Division decks.